One of the auto industry’s dirty little tricks is the practice of lenders giving kickbacks to dealers for charging high interest rates for the car loans. A good example of this would be when a buyer has been qualified for an 8% loan rate, the dealer can, and will in most cases, attempt to charge a higher rate. Many dealers will tell you they have a 12% rate available (a lot of consumers do not know better) and will jump at the deal just to get credit and drive away in a new or used car. Your $20,000.00 automobile over a 60 month period would have had a $433.56 payment at an 8% rate but now because you signed your loan agreement for a 12% rate you payment will be $475.64. Guess who get the extra $42.09 per month? You guessed right, the dealer who suckered you into the additional rate of interest. To get the best possible deal on a new or used car or truck, knowledge and information is your best bet. Knowledge is always power in these cases. Dealer scams such as the increased interest rate, packed payments and other common little tricks can quickly remove any savings that you thought you were receiving. Learn how to calculate you own monthly payments, use the internet to your advantage and learn how to negotiate with dealers. This is one of the oldest tricks in the book. When a dealer “loads” your payment you are literally being ripped off. Here’s how it works: You ask how much the monthly payment will be on a certain automobile and the salesperson will quote you either a slighly higher APR or loan amount. It might not be much but if the actual loan payment should be $325 a month and their mathematical shenanigans push it up to $365.00 that could end up costing you an additional $2300 on a typical 60 month car loan. It doesn’t seem like a small amount anymore does it? It’s a very difficult scam to detect unless you go into the dealership with your homework completed. Before you go into a dealership, gather all of the pricing information on the cars you’re interested in so you know what the payments should be. An informed consumer is a lot harder to fool than an uninformed car buyer. This is no guarantee you won’t be ripped off but your odds will be a lot better. On the other hand, if you agree to this packed loan payment without comment the dealer will attempt to boost the final price again and again and again. If you’re not prepared for what can happen at each step of the car buying process a salesperson will use every trick in the book to separatate you from your money. As you work your way towards a final deal you’ll be offered high price items like extened warranties, undercoating and clear coat paint layers. If you’re not careful you’ll end up paying extra for items added to the car at the factory! Sometimes car dealerships make more money leasing cars than selling them. Pushing cars out the door isn’t always enough. Margins are tight and profits are slim so some dealerships do their best to herd car buyers towards a leasing option. One way car dealers trick people into leasing is by quoting new cars at prices so highly inflated that the leasing option appears to be a better deal. The money you save if you fall for this is only an illusion. In reality you’ll pay far more to lease a vehicle than purchase it. Here’s another example that shows how doing your homework beforehand can save you a ton of cash at a car dealership. We can’t say enough about doing your due diligence and research all of the competitive rates on car loans, leases and prices of vehicles before you set foot on a dealer’s lot. One of the huge moneymakers of all time for car dealers is the ability to sell extended warranties. Most consumers have no idea how much profit there is on specific add on deal that the dealers try to sell them. Extended warranties are available though factory sources or from totally worthless sources and outlandish prices. All of these tactics are aimed at one thing only, “higher profits” for the dealers. This is an old trick of the trade. It allows the dealer to pick up a quick profit anywhere from $500.00 to $1200.00 in a hurry. Some manufacturers had already paid the dealers for new car prep work. Hmmmmm, most people do not know this and are duped into paying it again. This is pure rip-off profit for the car dealer, do not fall for this scam. Knowledge is power in this case. If you rely on the internet too much you may be missing the boat. You will need to do a bit more research than what the World Wide Web has to offer. If you think that all you need to be armed with is the dealer invoice amount that you so diligently down loaded from the internet to get the best price can be sorely mistaken. This is not the same as dealer cost. Another common error is, not knowing the actual prices that other in your area are paying for the same vehicle. If you think that a dealer who belongs to an internet buying service will be giving you the best price in town then think again. Make your research pay for itself. Make sure you visit as many dealers as you can to discuss prices of the same vehicle and make double sure they are the same in engine size and all add on accessories. It is also a good idea to already have your most recent credit report with you and also make sure you have learned to calculate both loan payment amounts and lease payment amounts. Another good idea would be to check with other lenders on their rates or even pre-qualify yourself for the best loan you can find before you start visiting you local dealers. If you’re buying a new or used car, AutoCheck® or another tracing service can give you a detailed history of the car and alert you to serious problems, such as rolled-back odometers or a salvage title that indicates the vehicle’s been in a serious wreck or damaged by water. You’ll need the car’s vehicle identification number, or VIN, usually found on the left side of the dash or the driver’s side door post. Fpr a small fee you can get a CarFax Report on an unlimited number of vehicles. If you’re out shopping for a new car, this allows you to check on the history of every one you’re interested in. Most car dealers are honest but if you are unlucky enough to find yourself on a crooks lot you could end up driving a lemon home. A quick check on a car’s history before you finalize the purchase can end up saving you a lot of heartache and money. 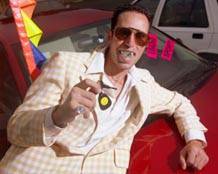 Don’t visit a car dealership intending to purchase a new or used car until you read our tips on how to avoid car dealer scams. You’ll know what to expect from the sales staff and could end up with a better deal. Get pre-approved for a car loan before you step on the lot. This can save you a bundle. Odds are you’ll get a better interest rate and having your own financing reduces your chances of getting scammed by a car salesman. If you can’t get a loan, you’ll already know it. If you can get a loan, you’ll know how much you can borrow and this will tell you how much car you can or can’t afford. Total Cost of Ownership – Maintenance, gas mileage, taxes, value depreciation etc. You don’t want to buy a car you can afford to drive off the lot but can’t afford to maintain. Pricing – If there are a lot of dealerships for you to choose from, find the one with the best deal. This seems obvious enough but many people don’t think about driving 15 minutes across town to save $300. You should also find out the sticker price. This will tell you just how low the salesman is willing to go. If you know that, make an offer, and refuse to budge, chances are the salesman will find a way to make it happen. Their job is to sell cars. Extras and Options – Know which additional features are offered and which ones you’re interested before you go to the dealership. Don’t let them convince you into adding more than you want or need. Some of them may sound nice to have but they’re not free and can cost you a bundle. Don’t negotiate based on monthly payments. One of the first questions a car salesman will ask you is, “How much can you afford to pay each month?” This sly question, if you answer it, will determine how much the car ends up costing you. If a car would have cost $300 a month but you let them know you can afford as much as $350, you can bet they’ll find a way to arrange things so that it ends up costing you $350 a month. This is one reason why it’s so important to enter into negotiations with your car loan pre-approved. Don’t allow your trade-in to influence your new car’s cost. This is one of the many ways car salespeople will try to fool you. If you let them talk about your trade-in in relation to the cost of your new car, they’ll come up with some confusing combination of numbers that will end up costing you more money. An example is giving you a lot more for your trade-in than you’d expected but adding this to the final cost of the car to “get the manager to sign off on the deal.” You end up paying more interest which could end up, over time, eating away the value of your trade-in! Be willing to walk away. Remember, you’re in the driver’s seat. If you don’t think you’re getting a fair deal or something seems out of whack or you feel you need time to think things over, just get up and go. You don’t have to be impolite, but don’t get pushed or bullied into a bad deal. You might be told that the offer only lasts so long, then so be it. There will be other cars and other offers. Some of them a whole lot better. Cars are expensive and you could end up driving it for yours so take your time and don’t let your emotions get the better of you. my son bought a car from XXXXXX auto in Milton and there was problems with the car he said they would fix it and we’ve brought it back again and gave them the list to be fixed and they fixed one thing out of the list and nothing else and I’m concerned because when we bought the car the price was $2850. and when mr XXXXXX put the loan through he said the loan would be $4000. My son has two babies to go in this car and it was his first car. This guy didn’t want us to buy the warranty through the loan company he offers his own when we bought the car he said if anything went wrong he would take care of it and he hasn’t. I want to now what to do because i don’t want anyone else to go through this with this dealership. Please help us.